Players are gearing up for the forthcoming European football championships by heading to 7 Sultans Casino‘s new triple bonus video slot this week, lining up on the terraces to check out Shoot! Featuring some of the greatest footballers of all time, this big, fifty pay-line game has a nostalgic retro feel allowing you to relive a by-gone era of the greatest game on earth accompanied by superb graphics and an excellent soundtrack. The game is based on iconic Shoot! Magazine, established in 1969 and one of the most popular sports magazines on the planet. The big attraction in Shoot! is its Trade ‘Em Bonus, from where two other bonus features can be accessed to boost the player’s bottom line. When 3 or more Bonus Scatter Symbols appear on the five reels this generous second screen feature is triggered, transporting the player to a 1970’s school desk covered in 12 trading cards and awarding 4 picks to reveal generous prizes. In addition to valuable prizes, special tokens are available giving the player access to either the Free Spins or Magazine Bonus – two additional bonus levels. In the Free Spins screen the player hits a spin button in front of a plastic toy scoreboard, which reveals a random number of free spins that range from 10 to 35, with all wins doubled whilst the feature is running. The Magazine Bonus resembles a child’s bedroom from the era, complete with shagpile carpet and "groovy" bed-linen. The player selects from 12 Shoot! 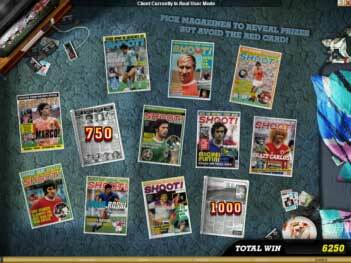 Magazines spread across the floor until a ‘red card’ appears to end the bonus, returning the player to the Trade ‘Em bonus if any picks remain unclaimed there. 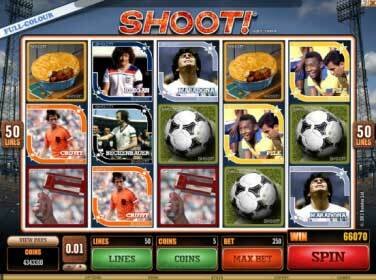 In addition to this interactive, rewarding and very entertaining bonus opportunity, Shoot! offers Wilds and Scatters that can be used to build winning combinations from wagers in a range of 0.01 to 100.00. Given that the game is based around football’s golden era, it’s perhaps unsurprising that the achievable wins are substantial, with the base game offering a top take-home of 15 000.00, and double that on Free Spins, whilst the bonus game can provide up to 10 000.00. 7 Sultans Online Casino is among the first to offer this outstanding video slot, so grab your rattle and a pie, cram into the terraces and cheer your way to profits! With this iconic brand there can be no substitute! Hurry hurry hurry! The football season is almost done and dusted and any gamers that wish to stick wagers on the final few matches of the season are desperately running out of time to do so. The good news is that there is a range of high profile excellent games on offer in the final closing fortnight that could see you find big odds to play with. If you’re a betting man that is! Titan Bet Sportsbook is one just one of those places where you could pick up some extra dough to wager on the final matches of the season. Titan Bet Sportsbook is offering up to £25 per person for signing up with them and depositing cash into your new account today but that is not all they have on offer. Like Bwin and other successful online sportsbooks, Titan Bet now has a multi-bet offer that means if you successfully predict the outcomes of several football matches on the same ticket your winnings are doubled and sometimes trebled, depending of course on what it is that you have bet upon. A fresh approach adds more fun and excitement to video slot playing. 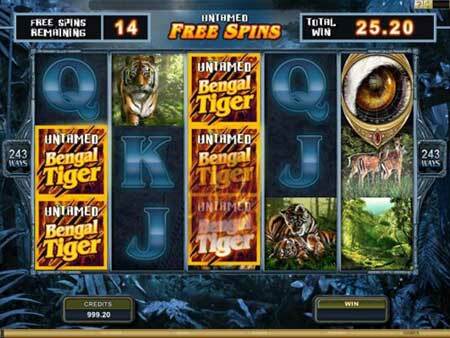 Three innovative features enhance UNTAMED – BENGAL TIGER, the latest 5 reel, 243 ways-to-win video slot launched by Platinum Play Online Casino this week. With a theme based on one of Nature’s most magnificent predators, this beautifully presented game introduces Collect-A-Wild TM, Lucky Nudge TM and Your Gamble TM features, all of which are set to become popular additions to online slot action in the future. In Collect-A-Wild TM, each Wild symbol that lands on a reel will add a Wild token to the counter beneath the reel. When 4 wilds are reflected on the counter, the entire reel turns Wild on the next spin and remains so for the following 4 spins. 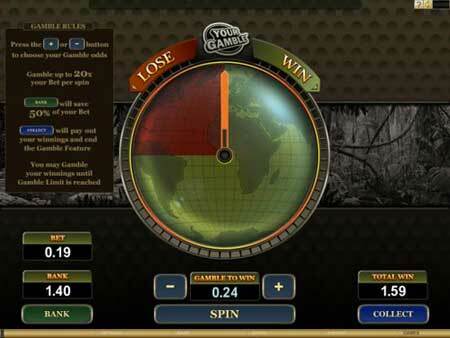 Up to 5 reels can turn Wild, effectively increasing the chances of significant rewards. Scatter symbols may peek from just above or below the reel edges in the Lucky Nudge TM feature. If there are 2 other scatters on the reels, there is a possibility that the peeking scatter may nudge on to the screen and trigger Free Spins, further improving the chances for player reward through Free Spins. The new Gamble feature allows punters to adjust their gamble odds, allowing the player to gamble a single win as many times as desired and monetarily possible, whilst still allowing up to 50 percent of the win to be safely banked if the player so wishes. The feature is designed to give the player personal flexibility and choice, empowering personal betting strategies. These new attributes join the already popular Trailing Wilds TM feature in the Free Spins cycle, leaving wilds on screen as they slide down. Three or more Eye of the Tiger icons across the reels trigger 20 Free Spins with a 1x multiplier in this game, which complements the built-in Wilds and Scatters. 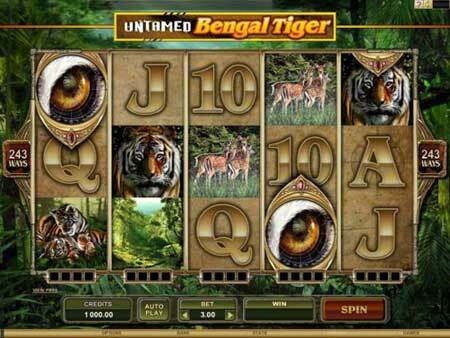 These new ideas, aimed at improving opportunities and increasing the personal control of the player in a highly entertaining gambling environment are well worth a test drive, so click over to Platinum Play Online Casino now and select Untamed – Bengal Tiger from our wide selection of top slots. We’ve covered Spin Palace before, but it is always good to check out some of our previous visits to see if anything has changed since the last time we were there, or if in fact an online casino is still running the same good solid promotion. Spin Palace’s welcome bonus it seems has proven so popular over the last few months that it is still going strong. So let’s remind ourselves, what are we talking about here? Well as before, new gamers at Spin Palace Casino are entitled to a 100% match deposit bonus which could see you snag a grand for joining the Spin Palace Casino crew. The welcome bonus is broken down into five instalments. Your first deposit at Spin Palace Casino will see you net a 100% bonus up to £100 whilst your second is worth a total of £125 with a 25% match. Dropping your dough into Spin Palace Casino for a third time will see you rewarded generously with an additional match bonus, this time at 50% up to £100. Forming the basis of the fourth instalment is free spins on the Tomb Raider: Secret Of The Sword slot. One hundred of them to be precise, every Sunday for the next year. That’s 52 week of free spins, totalling up a lovely bonus of 5,200 free slot machine spins. Once you have used up your free five thousands spins, you’ll receive your fifth and final bonus, one year after you first registered in the form of an anniversary bonus worth a 100% match up to £105. The self-proclaimed world’s best poker room is at Titan Poker, and whilst their claim for being the best poker site may be arguable, Titan Poker’s unbeatable welcome bonus for new players wishing to try their hand at the online game, certainly isn’t. Titan Poker has one of the biggest online poker bonuses for fresh poker newbies of any online poker site. How big are we talking here? How does a two hundred percent match deposit bonus up to two thousands US Dollars sound? On top of this staggering welcome package by Titan Poker, they are also prepared to offer you, as a new gamer, four free tokens to an exclusive event known as the $2,500 New Depositers Freeroll. There is a potential $10,000 to be won with your four free tokens in this exciting and exhilarating challenge, and it can be all yours just for signing up and playing at Titan Poker today. If you don’t want to play online poker online, Titan Poker will also cough up if you bring along a friend to play alongside you. In fact, there is a possible $500 bonus for every single friend to bring to the table to play at Titan Poker. This invite-a-friend bonus works on how often your friend plays. For instance once your friend signs up, deposits $50 and wins 100 bonus points you’ll bag the same, when he or she bags 750 points you’ll net $150, followed by an additional $250 when they reach 1,250 points. The full points and bonus tables are available on Titan Poker’s website today. So if you fancy a stack of free cash, and don’t mind trying out your online poker face, then Titan Poker is really worth checking out. Good fun, good luck!